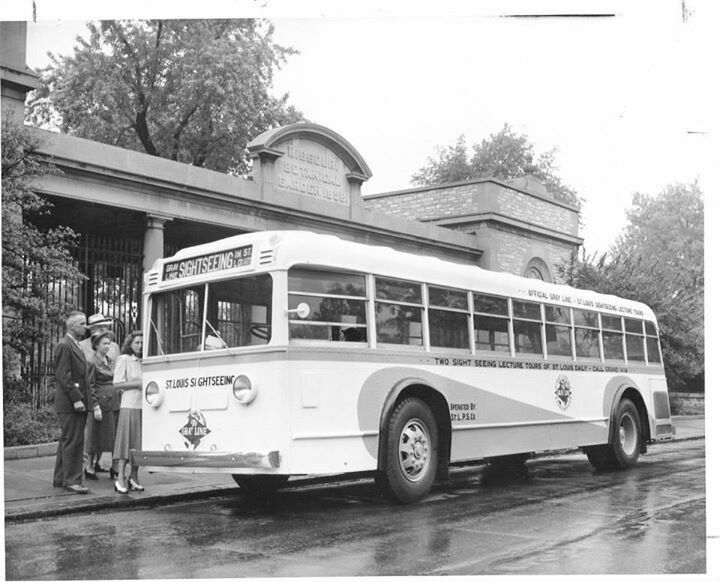 Pictured is a special sightseeing Public Service bus parked along Tower Grove Avenue in the 1940s. Behind it you see the old main entrance to the Missouri Botanical Garden. The Botanical Garden is hosting tomorrow’s Green Homes Festival that features a Metro Arts in Transit MetroBus painting, happening from noon-2 p.m. This year, the festival will be held at the Butterfly House in Faust Park. For those who want to take transit, the Butterfly House is right on the #91 MetroBus line. For more information on the festival and bus painting, click here. I’m going to guess that it is springtime in the late 1940s and it is at the Flora Gate (now Spink Pavilion) of the Missouri Botanical Garden.